WASHINGTON, DC – Amidst speculation over details of a possible tax agreement between Switzerland and Britain, Global Financial Integrity (GFI) reiterated the message that a broader, global solution to illicit financial practices and banking secrecy is needed. It is estimated that individuals have about US$12 trillion of assets in jurisdictions other than their own countries of residence that are not declared in their own countries of residence; the lost tax revenue annually from such undeclared assets is estimated at US$255 billion. Tax evasion by corporations and other entities is also a major problem. GFI is calling on the G20 to implement broader, global reforms at the next G20 summit, to be held in Cannes, France in November. 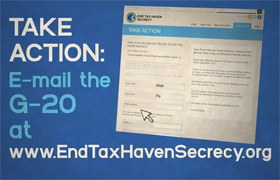 In addition to conducting high-level outreach to the G20, GFI has launched—in coalition with NGOs from around the world—the End Tax Haven Secrecy (ETHS) campaign, a global grassroots effort calling on G20 leaders to end tax haven secrecy at the Cannes Summit. The campaign, which just launched a new web video this month, has already generated roughly 10,000 letters to G20 leaders from individuals world-wide. To learn more about the campaign, visit www.EndTaxHavenSecrecy.org. Visit the Task Force on Financial Integrity & Economic Development’s portal on Automatic Tax Information Exchange for more information on the automatic exchange of tax information.